When immigrants arrived in the New World, their cultures thrived in the freedoms they found. Few traditions were as vital as those of Slovenia. Here's their music - indelibly itself, yet uniquely American. 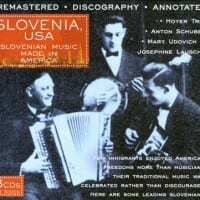 Expertly compiled, remastered and annotated, this collection will not only be indispensible to the worldwide Slovenian community - it will also be a source of pleasure to lovers of folk music everywhere. Prepare to be whisked off your feet with the tunefulness, skill and uninhibited joie de vivre of this music. These are hidden treasures never before re-released. JSP is blazing a trail with amazing reissues of Balkan and Eastern European music and the musical discoveries are often stunning.